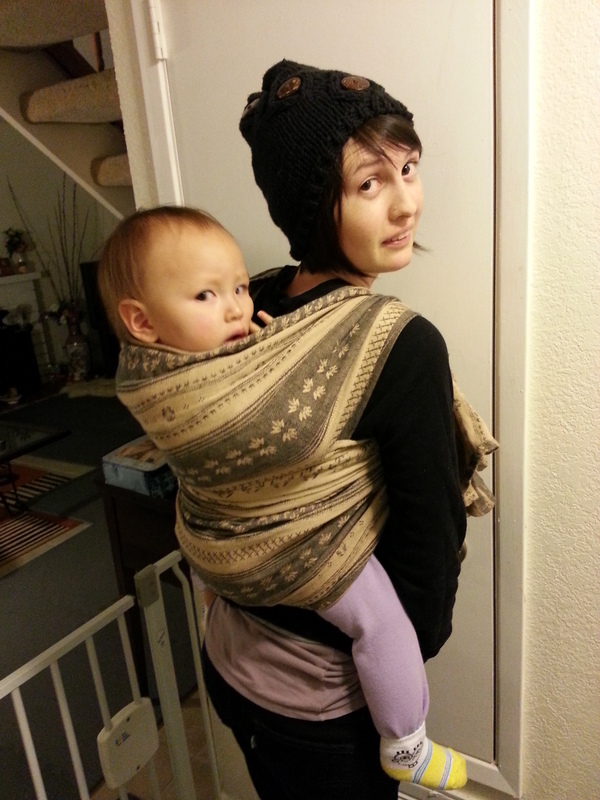 When I first dove into the world of Woven wraps, I found back carries to be really daunting. I was not exactly flexible enough to reach the high-up places on my back that I thought I needed to in order to make a “secure seat”. 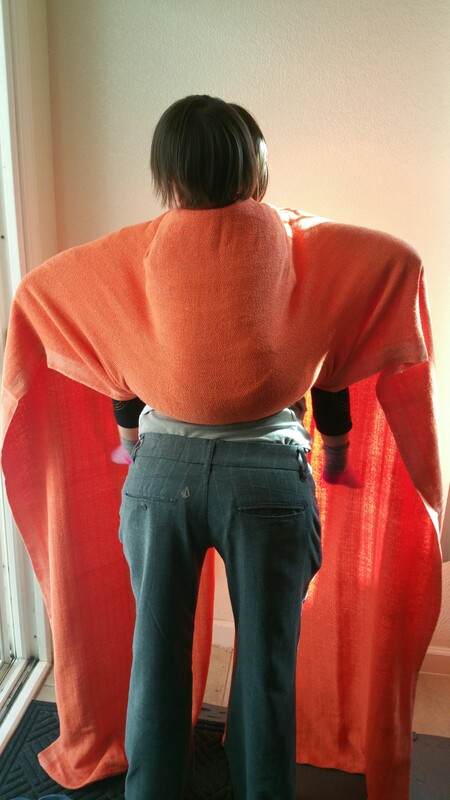 That combined with an arching, leg straightening toddler… meant that it took me many many months before I was confident enough in my wrapping abilities to consider taking a stab at it anywhere but in the safety of my own bedroom. By far, the most difficult part of the whole back carry process, was trying to make and maintain that deep seat. 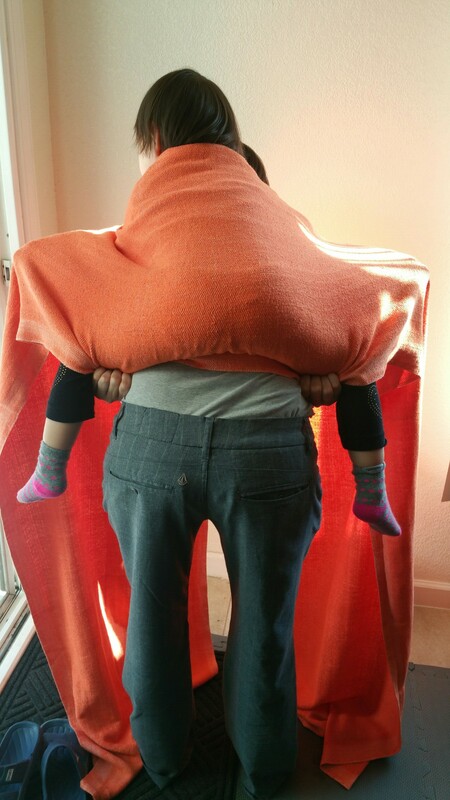 Some of my early teachers tried to help me out by teaching me the “pants trick” of tucking the wrap into the front of the baby’s diaper or pants before getting her up onto my back to help keep the wrap in place. It was a good cheat as far as getting her up there and getting the confidence to learn how to spread the cross passes, but in retrospect it actually kept me from grasping the actual function of a deep seat entirely… something that eluded me in the months to come. My naïve understanding was that I was trying to get as much fabric in between me and baby to keep it from coming undone once she was back there. The more fabric I could shove up there, the less chance of her popping that seat. Or so I thought. Now a few years and hundreds of wrap jobs later, I can safely say that telling someone to tuck the wrap into the baby’s pants or to “pull the fabric up to the baby’s belly button” in a front carry, is not doing them any favors. A seat, if you can picture it, is actually mimicking a hammock. Just as you would sit in a hammock, you want your baby to sit in the wrap. The weight is on their bottom, their knees are higher than the bottom, and there is no excessive fabric pulled up between their legs. Oh Boy, looks like she’s standing practically. I remember thinking I had gotten such a tight wrap job, too. So, what’s the big deal? I did it wrong all those months, I even defended the pant-tucking method pretty vocally in some Internet groups. Why did it matter how it got there? The wrap job could still be secure, right? In theory, yes. But what happens when you leave all that fabric bunched up between the baby’s legs and then finish your carry, is that all that bunched up fabric is actually slack in your bottom rail. Slack that will be brought out into your (once seemingly tight) wrap job as soon as your baby starts to bounce around back there. It will start to creep from the pit of their knees to the middle of their little thighs and before you know it you have a baby back there that is practically standing up straight on your back with the cross passes digging into their thighs. 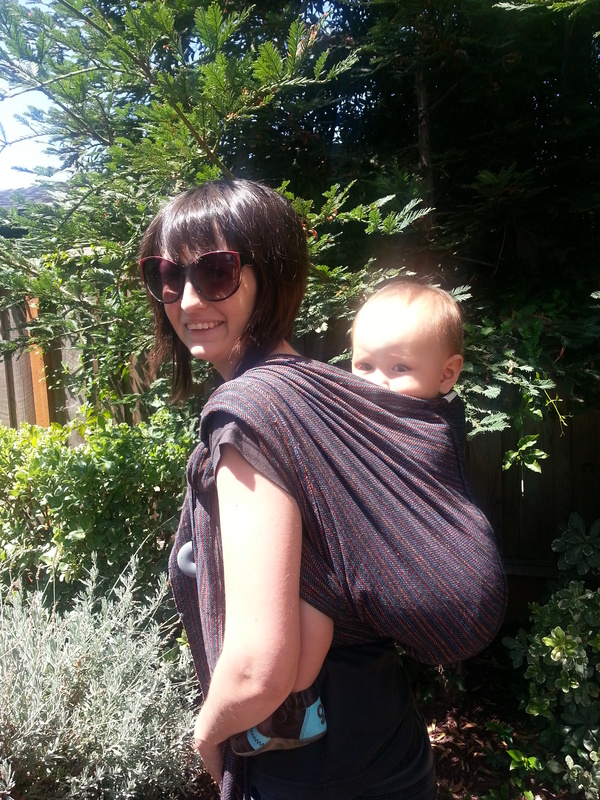 Has anyone experienced this babywearing fail? This was back in the “pant trick” learning days for me. Look at that bottom rail! So much slack, it was falling off my shoulders. It used to happen to me all.the.time. I would have the tightest wrap job ever, and about 15 minutes later she would be sagging and my shoulders would be aching. 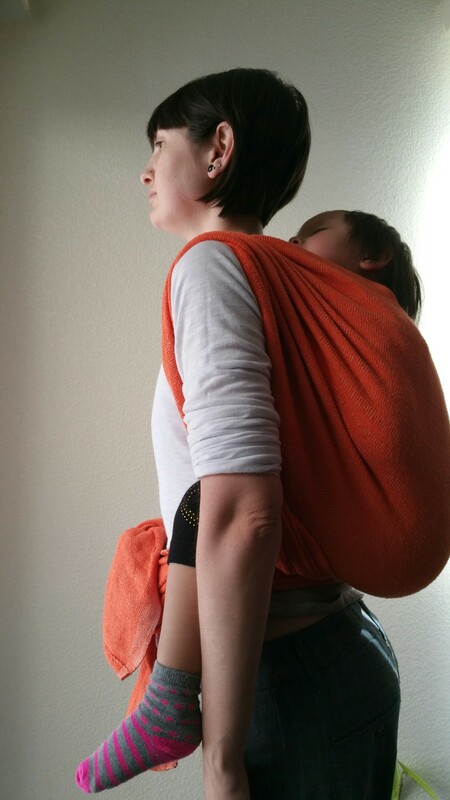 No matter how good I got at cross passes and fancy finishes, it was never as comfy as a Meh Dai or SSC for me because I didn’t realize I was still not getting the most fundamental part of back wrapping my toddler. The day it finally clicked, the whole wrapping thing completely changed for me. It was so much less about flexibility than I realized. Now that we’ve cleared up the controversy of the pant trick, lets walk through the process of getting that coveted deep seat. 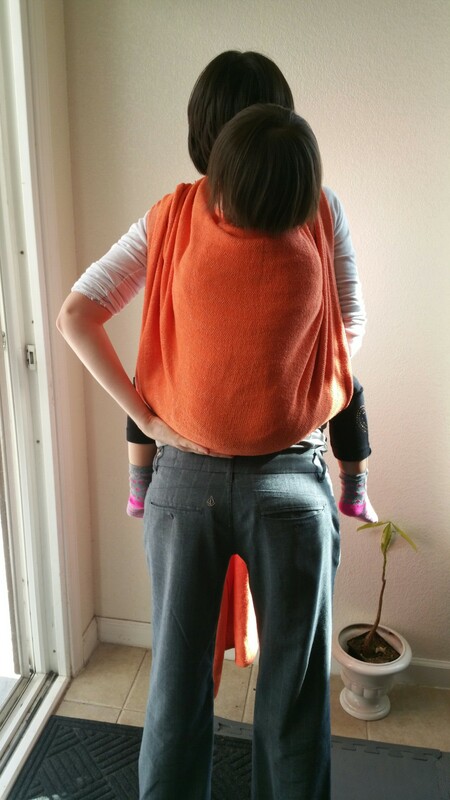 With the baby on my back and the top rail tightly pinned, I use both hands to reach back and pull the woven fabric in a downward motion, getting all the slack out of the mid-section of the wrap. Pulling all the slack out. Reaching between the baby’s legs and spacing my hands about the width of the baby’s shoulders apart, I grab the bottom rail and bring it upwards, enveloping the baby’s bottom in the fabric and helping them to bring their knees upwards and bent into the spread squat position. Think of the motion as holding a piece of paper on both ends and sliding it between your body and the baby, rather than pushing the fabric up between you both. Placing hands between baby’s legs, about a baby’s shoulder width apart. At this point, it is best to stand almost completely upright, allowing the baby to bounce down into that seat before doing your strand by strand tightening. Stand up straight and bounce baby down into seat. Finally I bring any extra slack up over my shoulders immediately to help keep the baby from trying to straighten their legs. It is significantly harder for them to do that when they are in a spread squat position. Don’t over-tighten! You will pull out your seat. Pull your bottom rails up over your shoulder and immediately take out any remaining slack. The end result, is a baby with their bottom resting deep in a hammock, knees higher than their bum in that coveted “M Position”. Side view: Knees higher than bum, knee to knee coverage, “M position”. Need some more help? Here is one of my favorite tutorials on how to make a seat in a woven wrap. Faith’s videos are always a go-to for me. You can watch all the videos in the world, but nothing compares to some hands on help. If you can find your way to a Babywearing International Meeting nearby, you won’t regret it. One final note on the subject, you may notice that this method is totally unpractical for a newborn baby. 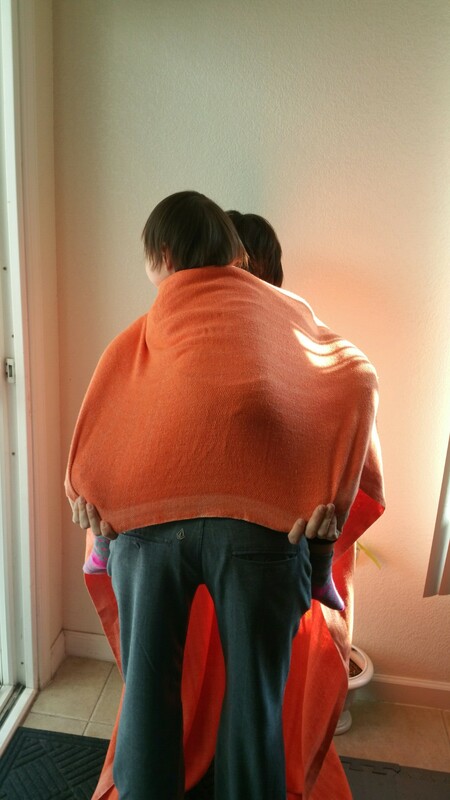 There are different methods to utilize when wrapping a very small baby on your back. If you are new to wrapping and are interested in back wrapping a newborn, I strongly encourage you to seek hands-on help to learn the safest and easiest methods for this undertaking. Go forth and create baby hammocks! Here’s me demonstrating how I used to struggle to try to make a seat before it finally clicked. Next Is It Too Hot to Babywear? This is amazingly helpful, thank you! I’ve known something wasn’t right with the way I’ve been trying to make a seat for a back carry since I started but haven’t been able to find any useful information until now. Thank you for making one twin mama’s babywearing journey a lot easier! Aaah yes, 1 year old back wrapping can be a workout. Know that you aren’t alone. Yes. I just *got* this, like, two weeks ago, and it has made all the difference for me and my t-rex arms! 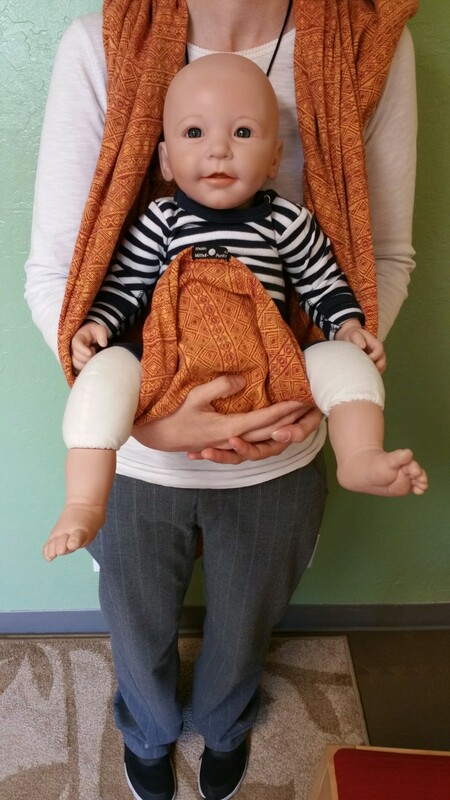 what’s your opinion about pulling up the fabric between the baby’s legs and holding it, then putting him on your back (still using the fabric to keep his knees up), and finally letting the pulled up part vanish while carefully tightening the bottom rail of the wrap? Of course the excess fabric can make the wrap loose, but I find pulling up useful for maintaining a nice position of the baby. If this method works for you, than by all means continue to use it! I use a method similar to that when wrapping a newborn. The problem is for many people, they are not achieving the “straight lines” integral to wrapping success when they attempt that method. They are misunderstanding what the point of pre-tucking the fabric is, and thinking they need to leave a bunch of it tucked up there in order to be secure. As I mentioned in the article, I spent the better part of a year making a seat by first tucking the fabric, only to realize later that I was actually making it much harder on myself. The “best practice” is that for a reason. Thanks for this elaborate reply! It’s clear now, I see your point. It’s great to have all these different perspectives – might be an excellent resource for mothers! Hi after reading this I’m starting to realise the trouser tucking is why my wrap job always ends up slack, have you got any tips on trying to wrap a very wriggly, small 11 month old, iv always trouser tucked for security of keeping him in the wrap when wrapping. Just spent 30 minutes trying this, and I’m now panting, sweating and crying with very sore wrists! While these are helpful tips, there is still a HUGE amount of arm and wrist flexibility required to get a deep seat on a baby. Maybe not a toddler, but my 6 month old leg-straightening baby’s seat is just pure and simple beyond my reach. I get the drawbacks of the pants tucking method, I really do. And you’re right that she sags after 20-30 minutes. But at least I can wrap her like that now for short periods of time without having to wait another year for her to grow enough for my arms to reach. Again, really helpful article – but saying that no flexibility required for this is a bit misleading. Learning to backwrap has a rather steep learning curve. I can relate to your frustration. Although I mentioned this method is less about flexibility, I definitely did not imply that it requires no flexibility at all. Any back carry (wrap, mei tai, SSC) will take practice – creating muscle memory, increasing your flexibility over time, and improving the speed in which you can accomplish the carry so you spend less time straining your body. Here are a few tips on addition that may help you with this method. 1. Start baby lower on your back rather than up by your head. 2. Don’t bend over horizontal because it puts pressure on baby’s stomach and causes them to flail, leg straighten, and get angry. Instead squat with your back still mostly vertical so baby’s button sinks down into the seat deeper. 3. 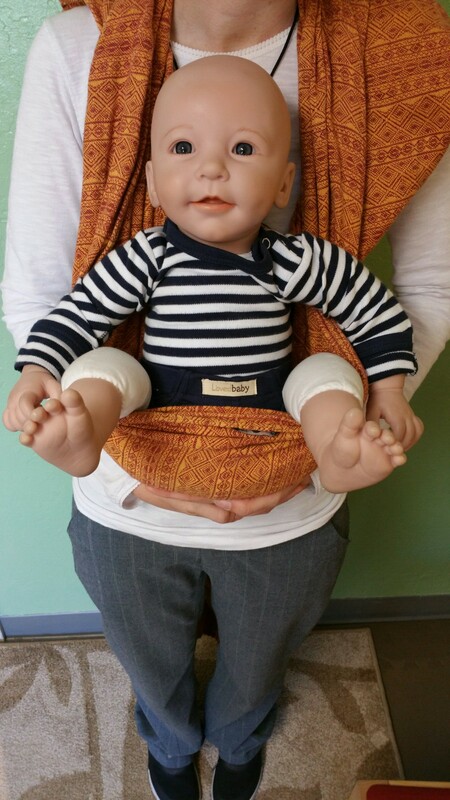 Practice getting baby on your back in other carriers such as a mei tai or SSC so you can increase your flexibility and confidence with getting baby back there and baby’s comfort with the practice before adding the unfamiliarity of the woven wrap. 4. Try a different carry. Something like a Secure High Back carry or back wrap cross carry could be easier to learn a back carry with and less emphasis on the seat until you have improved flexibility and feel more confident with seat making. I encourage you to reach out to a local educator or babywearing group. Without hands on help I would never have mastered a back carry.